I've had this TO-30 for several years and use it regularly for light duty tasks on a farm. When I purchased it there was an issue with coolant use and when first started after sitting it would run on three cylinders for a short while and exhaust some white fog. I just kept the coolant topped off and since it's not used hard just lived with the problem. 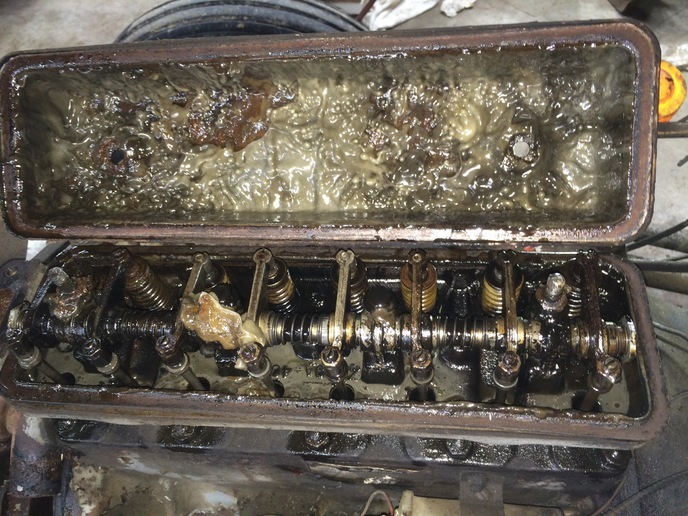 Recently the coolant issue has gotten worse and the engine suddenly developed a leaky rear main seal. So it's time to address the issues. 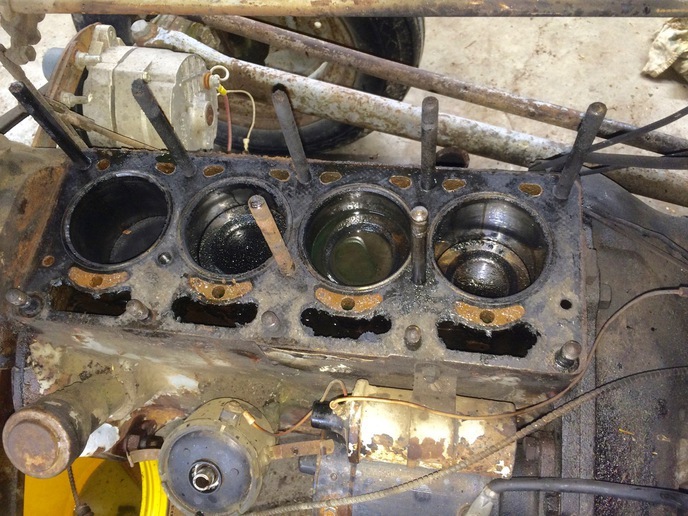 I pulled the head today expecting to find a cracked block but hoping that a head gasket might cure the problem. I found a broken valve spring on #1 exhaust. 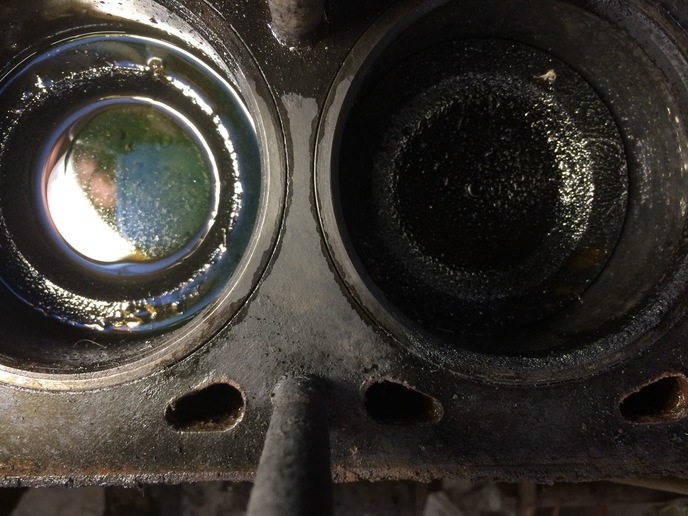 I found coolant in #3 cylinder but no obvious route from the coolant jacket to the cylinder. I see no sign of any cracking associated with the block. 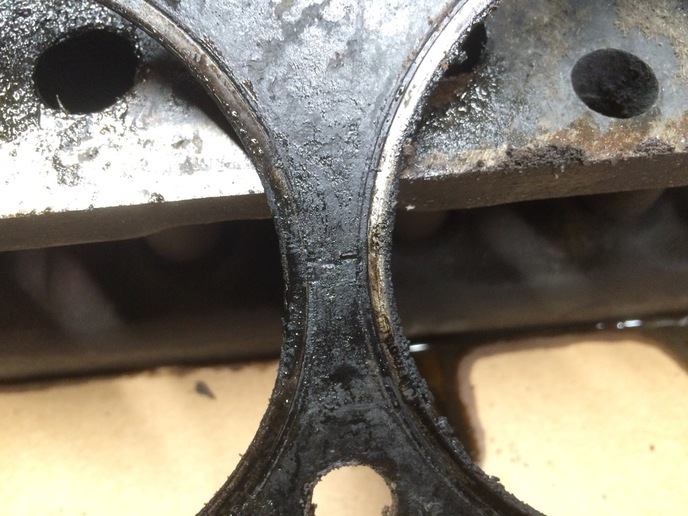 The head gasket shows deterioration between #2 and #3 cylinders, but no leakage between them or from the coolant jacket to the area. I'm going to keep going deeper. 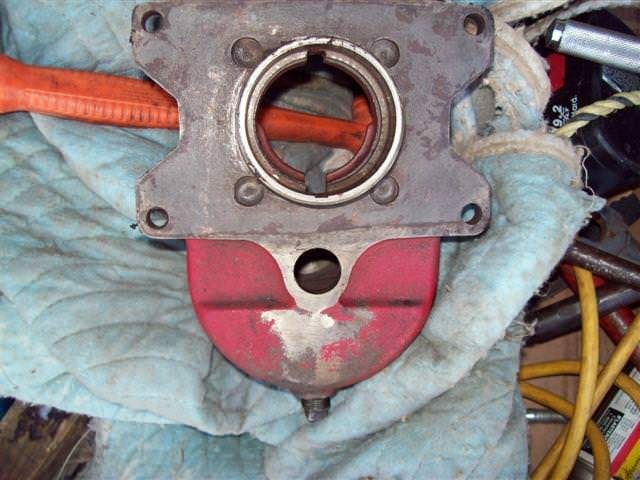 To replace the rear main seal will require near full disassembly. 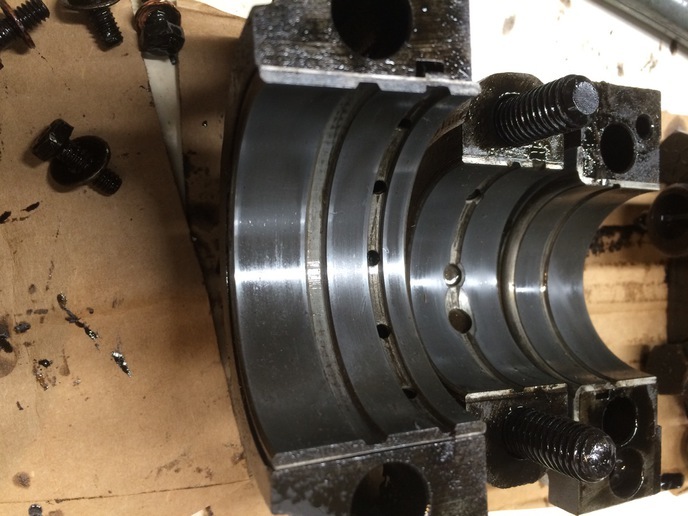 Hard to say what I'll run into associated with main and rod bearings/crankshaft condition. I'd like to return the machine to good operating condition with the minimum of money spent. I'd solicit any suggestions from members here about proceeding. 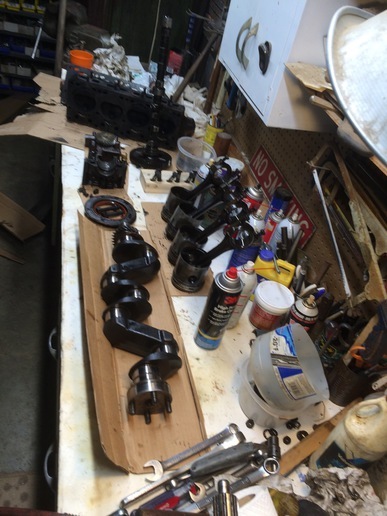 My current plan is to remove the oil pan and pop the pistons out. The cylinders exhibit minor wear near the top, I've seen worse and if I don't find any real problems I'll hone and re-ring. 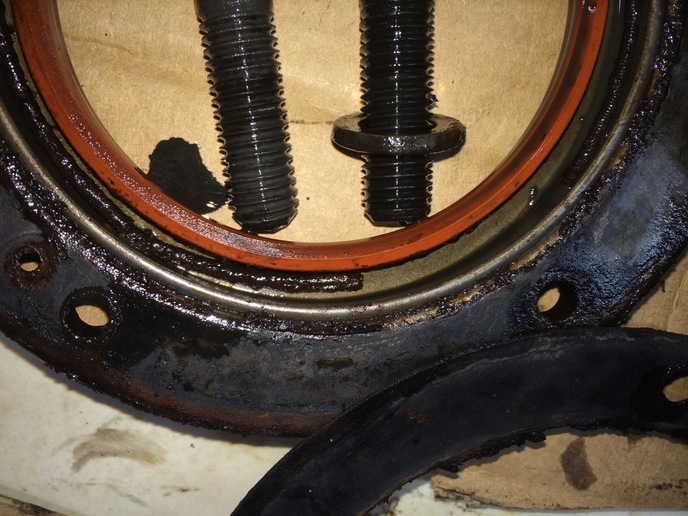 The rear main seal worries me - the engine has been decently oil tight, then suddenly there was a small but steady stream of engine oil exiting the bell housing - not a drip, but a stream. 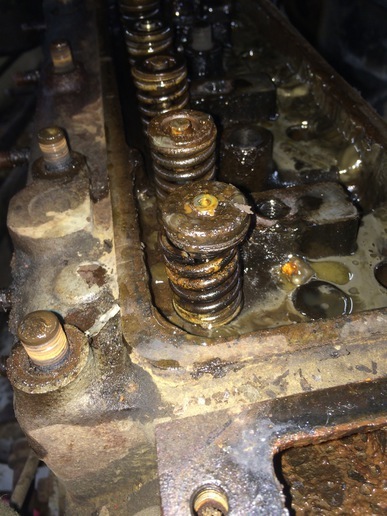 It seems to be all or nothing, sometimes it would start and run and no leak, the next time it would pump out the engine lubricant in a couple of hours of running. Dunno - All I know to do is look at the area, evaluate the condition of the crank and bearings, and replace what's necessary. I'll have that area open shortly... should I install the Sherman? know about a Ferg 30. Cast iron will not drill bad. Pilot hole and good sharp bits. 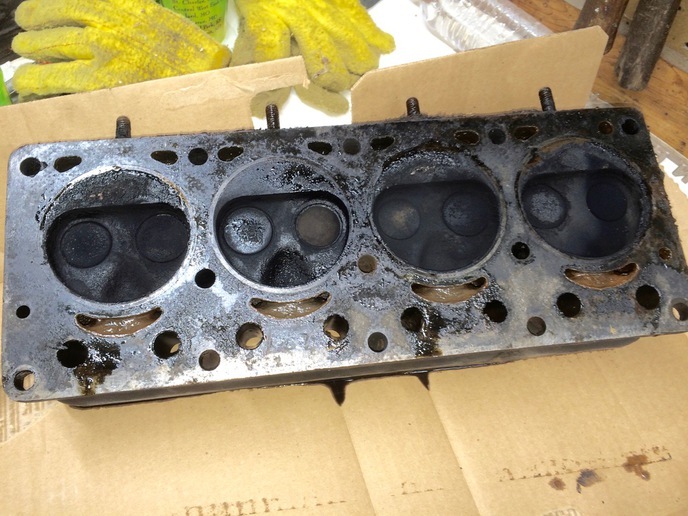 The head gasket was obviously leaking, that explains the coolant in the oil and #3.
there will be some crank and bearing damage from the contaminated oil, or just from wear. really not that much more work considering the option of laying under it with oil dripping in your face. easy job when sediment from the coolant gets under the liner! Those seals really need to be replaced anyway, at their age they have to be deteriorated. smoking. Even then it's a big shortcut than can easily come back to haunt you. 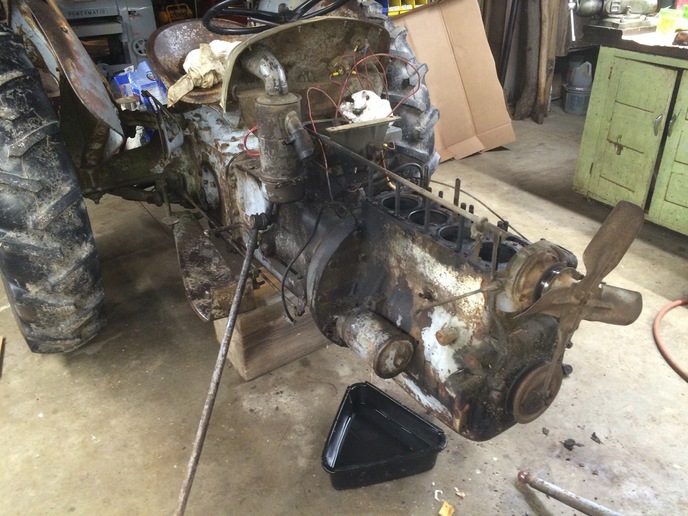 Your TO30 will be twice the tractor with a Sherman in it if it is a step up/step down. You will have many more possible gear combinations to mess up. Having grown up with one, I'd be lost without my Sherman. I?m with Steve on this. 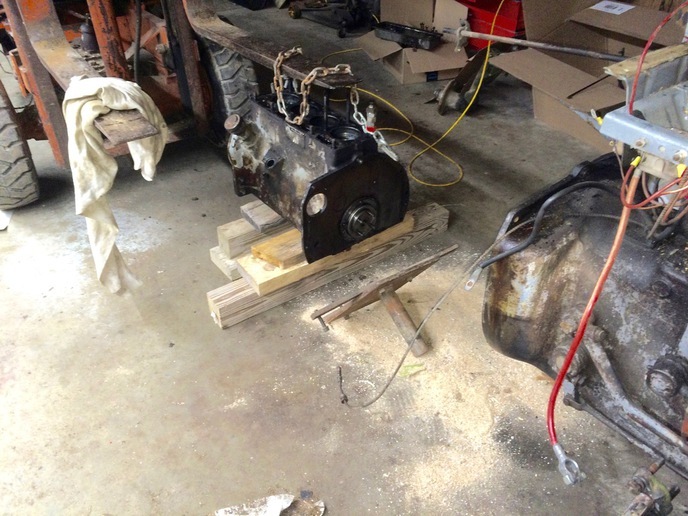 Pull the engine, get an inexpensive engine stand to park the engine on to work. 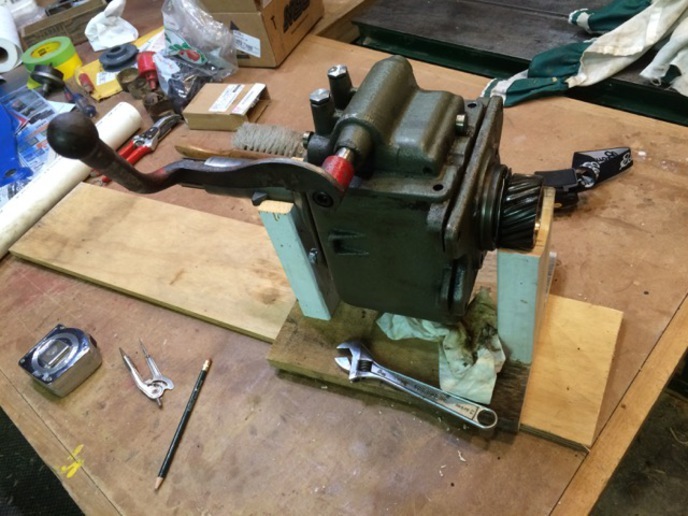 A sleeve puller is easy to fashion out of threaded rod and angle iron. Look for small cracks between the lower webs, like the one you have on top. A machine shop can put bolts into the block to pull the cracks together, this is called pinning. I have had three blocks done this way. In the end you will have a strong and fresh engine. 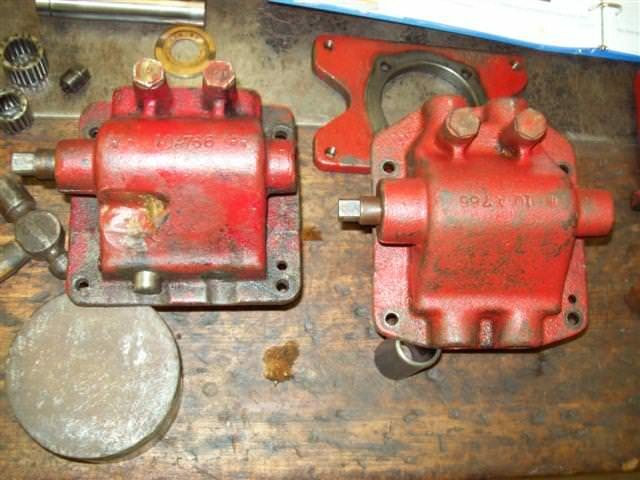 The original starter linkage was a safety item. 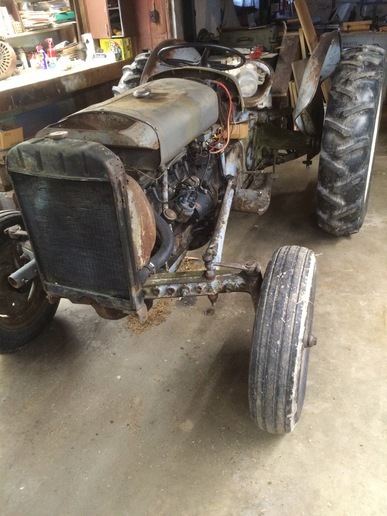 You cannot get run over by starting the tractor while it is in gear. I'd want to return it to that state. of the Case also altered to fit. If someone needs it to fit the ferguson and has the ford case I would swap. Did you have it apart? I've seen 'hole saw' mentioned different places associated with Sherman installation - what kind of hole saw is used for cast iron? Yea, replace the seal before install and fill with oil. dunno - what do you all think? It's nice to see you are getting the vanilla pudding out of there. Auto zone usually 'loans' tools, it shouldn't take you long to mike everything with a dial caliper. It looks good from the pics. 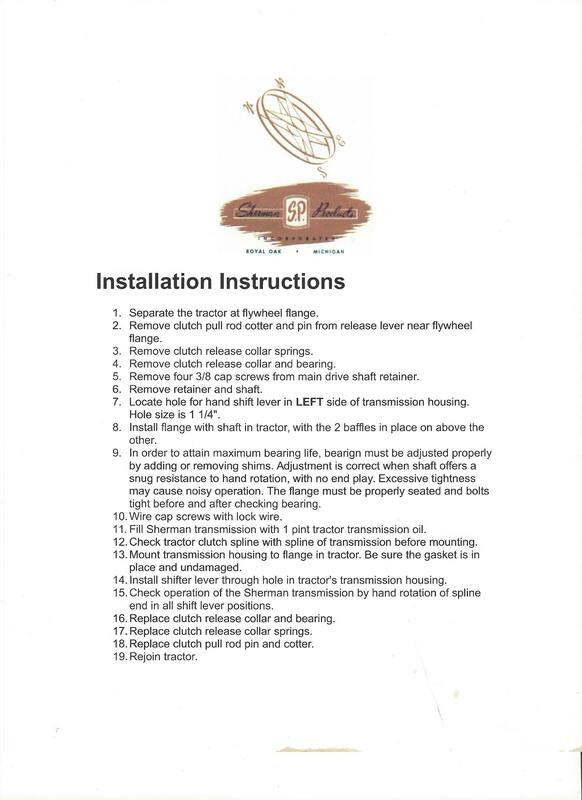 The o-rings and springs might be available on this site's online store. You need a gasket set at the least, but yeah, while it's this far, do the o-rings now. Leaks are a big sore spot on this model. And might as well get a new clutch while is down that far too.